Posted under Health Guides. Updated 28 August 2018. People with fair skin, light eyes, and blonde or red hair are at higher risk for getting skin cancer. Use a broad-spectrum sunscreen (that protects against both UVA and UVB rays) with an SPF of at least 30 or higher, and reapply every 2 hours or after swimming or sweating. Wear a hat, sunglasses, proper clothing and seek shade to prevent too much sun exposure. See your HCP if you have sunburn with: fever, headache, swelling of your face, chills, confusion, or dizziness. Most of us enjoy the warm rays of the sun. The sun feels nice on our skin and helps our bodies make vitamin D, which is important for calcium absorption and healthy bones. Yet sun exposure can be harmful to our skin and may lead to wrinkles and skin cancer. Sunburn can happen quickly (within 15 minutes), and skin damage can occur even before your skin turns red. In fact, specialists admit that just one blistering sunburn can double a person’s risk for developing melanoma, a severe type of skin cancer. So, the best way to get enough vitamin D is to take a daily supplement or daily vitamin. Who is at risk for serious sun damage and skin cancer? Anyone who spends time in the sun, especially without sunscreen, is at risk of having serious damage to their skin, which includes skin cancer. In fact, the EPA (Environmental Protection Agency) reports that more than 3.5 million new cases of skin cancer are diagnosed each year. Children are particularly at risk. UVA and UVB rays are types of sunlight that can cause the skin to tan, damage, and burn. Sunburns are particularly harmful to the skin, and there are three types. What are the three types of sunburn? With severe sunburn it’s also possible to have a headache, nausea, fever, chills, and/or dizziness. Skin cells are destroyed and the risks for certain types of skin cancers increase with each sunburn you have. How can I protect myself from too much sun exposure? Find shade. Try to limit time in direct sunlight to 15 minutes or less. Use a sunscreen with an SPF (sun protection factor) of at least 30 or more even on cloudy days. 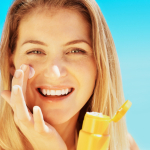 Choose a sunscreen that protects against both UVA and UVB rays. Apply to any part of your skin that might be exposed to the sun, including your scalp. Apply sunscreen (an ounce or enough to cover the palm of your hand) BEFORE you go out in the sun, even on cloudy days. Remember to reapply sunscreen every 2 hours, after swimming, sweating, and toweling off. Limit sun exposure between the hours of 10 am and 2 pm when the sun’s UV rays are the strongest. Cover up with clothing, a hat, and sunglasses that block UVA and UVB light. There are special brands of swimwear and clothing made to block the sun. Avoid tanning beds/booths. Tanning beds/booths use UV light that can damage your skin just as much as the sun’s rays. Check your skin regularly. Know your birthmarks, moles, and, freckles, on your skin. Make an appointment with your health care provider or dermatologist if you notice any changes or have concerns. Is there anything else I need to know about sunscreen? How do I treat sunburn? How do I know when to go to a health care provider with sunburn? You have swelling of your face, eyes, mouth, etc. Remember, you CAN lower your risk of sun damage, wrinkles, and many skin cancers by practicing good sun safety habits!